The Asustor AS1002T 2-Bay NAS Server is a compact entry-level NAS ideal for your home as a multimedia server. It is equipped with a 1 GHz Marvell ARMADA-385 dual-core processor and 512MB of RAM. This enclosure is capable of fitting two 3.5" hard drives in a variety of RAID configurations including RAID 0,1,JBOD, and Single Disk to suit all your storage needs. Together with Asustor's ADM operating system, this NAS can achieve up to 110 MB/s and 96 MB/s read and write speeds respectively. Connect to your network via a Gigabit Ethernet port, and use the two USB 3.0 Type-A ports for additional device compatibility. 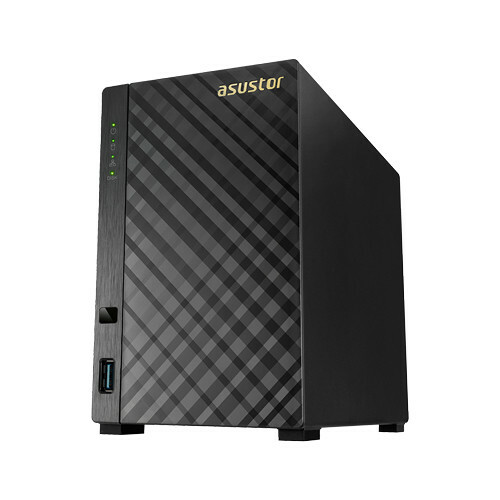 The Asustor NAS provides optimal data protection through RAID technology, automatic backup solutions, as well as 256-bit AES folder encryption. When paired with mobile applications (iOS and Android), Asustor's exclusive Cloud Connect technology lets you access data on your NAS device from anywhere. Additionally, the NAS device can be used with virtual environments such as VMware, Citrix, and Hyper-V. It also supports the use of NFS and iSCSI in the creation of shared storage for virtual environments. The AS10 supports a wide variety of multimedia entertainment devices and services such as UPnP/DLNA players and web browsers on computers, tablets, and smartphones. Connect to your AS10 via your home network or the cloud to access files and videos anywhere you need to. The AS10 series features built-in encryption engines so your data is protected from the moment it's stored on the NAS. Additionally, folder-based encryption gives you the option to select individual folders you want to encrypt as well as who has access to them. Keep an eye on important things with Surveillance Center. With Surveillance Center you can simultaneously view live feeds from multiple IP cameras, take snapshots, and control the pan, tilt, and zoom functions of all cameras through its browser-based interface. The AS10 NAS comes with 4 license free channels letting you setup 4 different network IP cameras. Box Dimensions (LxWxH) 12.6 x 9.4 x 5.6"
AS1002T 2-Bay NAS Server is rated 3.3 out of 5 by 3. Rated 4 out of 5 by Anonymous from Works as advertised - would buy this again. Set this NAS up as pure storage/backup with RAID 1 configuration using two 3TB WD Reds. Drives are easy to install. Software set up was not straightforward for a person with my limited IT prowess. I asked a friend of mine a few questions about mapping my PCs as he has a similar NAS...was able to get it going with no problem. First backup (complete PC hard drive) took over 36 hours. Second(different) PC backup took less than 4 hours. Files are easy to view. Happy with this purchase. Rated 5 out of 5 by kerry from Great and elegant little NAS!!! The price is good and the performance is up to 112MB/s in read.? Quite amazing! How much disk capacity can this device handle 4TB, 8TB, 16TB? Specs don't mention. I'm running 2 8tb WD Reds in Raid 1. I know I could have used Raid 0 at 16tb. Think you can definitely use 10tb or even 12tb drives also with the latest ADM software. What size drives can this hold while still having good air flow? Thank you. The question is HOW MUCH disk can this unit hold 8TB, 16TB?